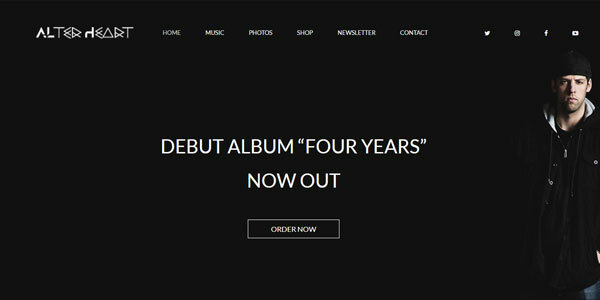 Do you or your band need a professional website built and designed? Then, I can help. I’ve worked with tons of clients to build websites using WordPress. If you’re unfamiliar, WordPress is a Content Management System that holds all of your site’s pages, blog posts, images, and other media. You can think of it like a website builder, but in reality, it’s much more complex than that. Many people set off to build their own website using WordPress but often struggle due to its complexity and the learning curve it takes to learn the system. If you’re not a web developer, it can be tricky to learn at first and build your own website with. If you do want to give building your own site with WordPress a shot, I even wrote up a full tutorial on how to do so here (specifically written for bands). I’d even encourage trying or at least checking out the guide even if you do plan to hire someone. And please don’t settle on building a website using Wix, Bandzoogle, or something similar. In the long run, you’ll be selling yourself short, increase costs, and you won’t have complete control and flexibility like you would if your site was built on WordPress. I know some of you would rather have a professional web designer build the site for you, and that’s where I can help. I offer affordable packages for band web design that allows bands to get a professional site up and running in no time. Yes. Up to 250 words. With each package, you or your band will receive a professionally designed and built website using WordPress. WordPress is one the most, if not the most popular platforms for building a website. WordPress holds all of your site’s content including pages, blog posts, images, etc. There’s also a backend to the site where you can manage all of this content. I’ll even show you how to manage your site as each package includes at least one hour of training via Skype (where I can show my screen and explain exactly how to manage the areas you want to edit). Each package has different options included with one being the number of pages included. Each separate page counts as one page (therefore, your homepage counts as one page, so does your contact page, etc.). I can also do a similar one-page design that includes sections on one page that are scrolled down to when clicked on from the main menu. In this case, each section would count as a “page”. 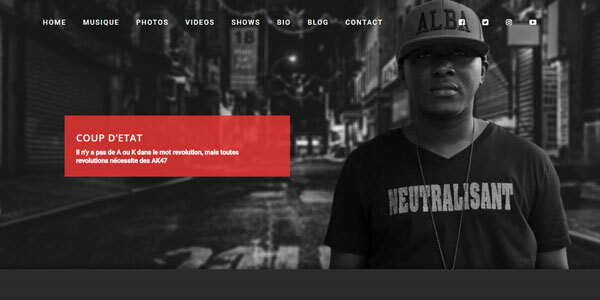 An example of each page could include your homepage, a biography page, a music page, a photo page, and a contact page. Further, you may consider an events page, a news page, a shop page, a blog page, etc. Unless otherwise noted, you supply all of the content on the website (written text, images, video links, video thumbnails, MP3s, etc.). You would tell me where you’d like these to appear and I will add, format, and style them as needed. For packages that include the custom music player option, this is a self-hosted music player. This music player is hosted on your own site and all of the songs for the player would be added to the backend. In this case, each song can have the option for a download button or purchase link. For the packages that include image editing, this simply means I will edit your images as necessary and to the best of my ability to make them look the best they can on your site. This might simply mean cropping but I can also take a professional photo of you or your band and replace the background for a featured image on your homepage. For packages that include email newsletter setup, this means I can set up a free account for you with a popular email marketing service like MailChimp (this is the one I’d recommend for bands starting out) and create an email signup form on your site so you can begin to collect emails from fans. Lastly, each package includes a specified number of rounds of revisions. A round can be as many revisions as you need, but they must all be sent to me at one time in a coherent, detailed, and list-formatted email (this makes it much easier for me to understand and implement any changes you may need). That list of revisions counts as “one round”. To be clear, a revision includes a change you may need. For instance, the color of something needs to be changed, the formatting needs to be changed, the style of something needs to be changed, etc. It is not an addition to the website on top of the included options laid out in your package (or any additions we agreed on prior) such as an additional page, additional images, etc. I can certainly make these additions, but it will be an added cost. If you’d like complete help with buying a domain and hosting account or you’re interested in a monthly maintenance or “manage everything” package, please contact me for special pricing. Actual live sites may have changed since I originally built them as the owner continues to change the design or add content.